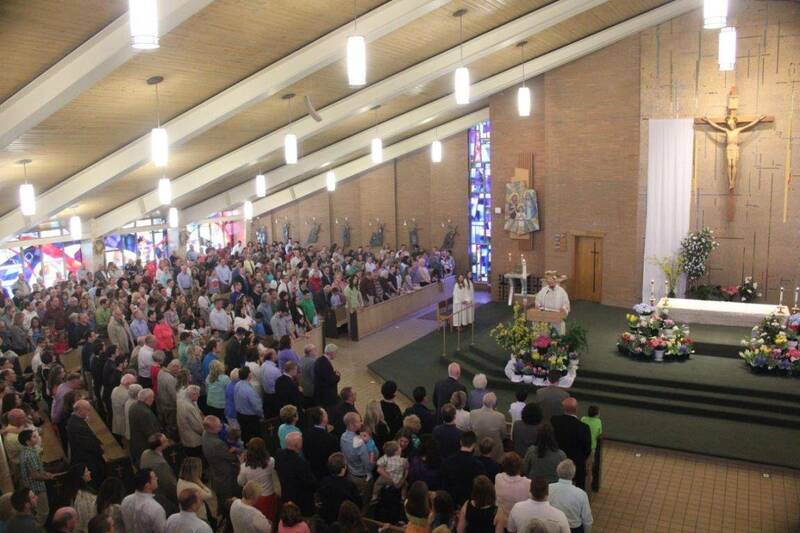 As a Parish, Holy Family is committed to remaining in the presence of Our Eucharistic Lord at all times. Members of the parish sign up to pray before the Blessed Sacrament for one hour a week. Those who have made these hourly commitments make it possible for the chapel to remain open at all times for all visitors. Since it began, this powerful form of prayer has changed many lives and has greatly enriched Holy Family Parish. The Chapel is open 24 hours a day, 7 days a week. The mission of this group is to support and pray for vocations to the religious, deaconate and priestly life. The group meets for Avila rosary on the first Saturday of each month at 7:30 am, attends the 8:00 am Mass and offers Avila prayers one half hour after Mass on the First Saturday of every month. This also fulfills the first Saturday devotion. This group is associated with the Cleveland Diocesan Avilas. This group meets every Thursday for prayer, song and worship. Each week several parish households join in praying for all of the Church’s vocations. It is our hope that their prayers will not only strengthen their own vocations, but also aid our entire parish to grow in awareness of our own. As part of the preparation before celebrating the Sacrament of Marriage, engaged couples attend pre-marital preparation with one of the parish priests or deacon. In addition to these meetings, an integral part of this preparation process involves married couples, who are parishioners, and are willing to assist the priest or deacon in preparing engaged couples through the Sponsor Couple process. These meetings occur after preparation has begun with a priest or deacon, usually 4-5 times, and are scheduled based upon the engaged couple’s schedule and the sponsor couple’s schedule. Hosanna People are parishioners committed to one another in the Lord and family renewal in the Catholic faith. This group of adults meets for prayer, praise, intercession and spiritual growth studies three times per month; on the 2nd, 3rd, and 4th Thursdays. Beyond Just Faith is a ten month adult spiritual formation process centered on Catholic social teachings. The process involves weekly meetings starting in September, reading, watching videos, hands-on experiences in the community, two retreats, prayer and discussion. Additionally, Beyond Just Faith works to encourage works of social justice in our community and beyond. NFP is true family planning. NFP promotes openness to the transmission of human life and recognizes the value of children. NFP is not calendar rhythm. Classes are offered throughout the year. Parishioners phone or write the parish office to request prayers for special needs and burdens. The prayer line requests are given to people of the parish who pray for those needs or burdens. The Serra Club works to promote and encourage religious vocations to the Church. Formed in February 2007, this Committee seeks, through prayer and education, to assist the parish in learning more about our God given vocation, so that we may inspire by prayer and example. We encourage others to recognize the importance of their God given vocation, and that of their families and friends. We are committed to encouraging others to choose the way of life… marriage, single life, vowed religious life, ordained priesthood, or diaconate… where Jesus wants them to be a more visible reflection of Himself to others.